If one hears knocking noises in the ancient ruins of Lycia, they may not come from archeologists hammering stones, but greek turtles mating. Immediately after waking from hibernation, the mating instinct starts up. The males follow the females with great interest, encircling them, biting them in the limbs, ramming them, and trying to mount them. 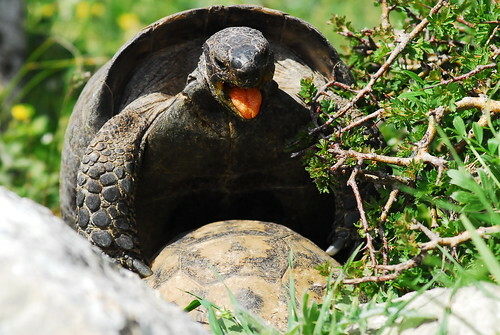 During copulation, the male opens his mouth, showing his red tongue and making squeaking sounds.